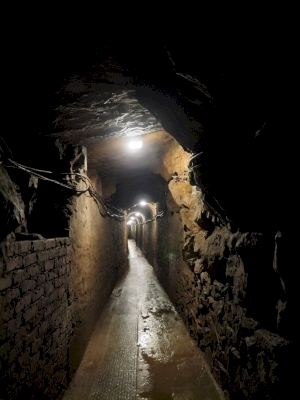 Tarnowskie Góry Lead-Silver-Zinc Mine and its Underground Water Management System is a historic mining landscape with mostly underground parts. Its hydraulic system for water supply is seen as innovative for its time. 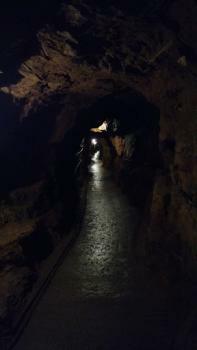 Its massive lead-silver deposits became known in the late 15th century. Lead was used in the smelting of silver from New Spain. A second phase of production started in the late 18th century during the process of industrialization of Prussia. So I arrived here just after it was inscribed. I would probably not have taken the extra few hours from my Czechia trip to reach it. There was no "UNESCO" sign anywhere but that was the only word I understood from the Polish guide. I saw an English tour inside but they were a larger group and the museum wouldn't start one just for me an hour earlier when I arrived. There is actually little history about the mine you need to know. The first part of the tour just tells you about how the mines work, equipment, steam power, yes I admit for someone who doesn't visit many this can be delightful - but it's generic mining stuff, plus the info about the town surrounding it is just extra padding. The second part is an annoying hike through corridors and that gimmick of a boat ride. What is supposed to be unique is the lengthy use of hydraulic water management system, the only thing special here. If you have been to a mine before then this is just a repeat again and again, plus the little "gondola" ride. I'm thinking there is more to the site than what you see on the tour else it's shockingly boring. Our guide was a very good and her enthusiasm was a big part of the overall positive experience. Our original, already ambitious, objective was to “sweep up” all 18 of our unvisited WHS (plus selected T List and some “revisits”) in Pol/Cz/Sk/Hun in 15 days - and then the 2017 WHC inscribed Tarnowskie Gory (TG)!! We added it of course, but, on what was a trip of “Mines”, I must admit it wasn’t approached with great enthusiasm. 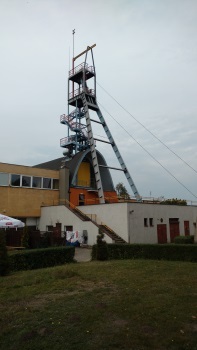 We had already visited Banska Stiavnica with a visit into the Bartolomej Pit and found that reasonably interesting, but did we really need yet another Mine? There is very little to see above ground in this WHS but there are 2 underground “trips” for which we had only the inclination, time and money to take 1. In the end we decided NOT to do the “Black Trout Adit” boat trip and opted instead for the “Historic Silver Mine” (These are signed locally and documented in Polish as, respectively – “Stolinia Czarnego Pstraga” and “Zabytkowa Kopalnia Srebra”). Our reasoning was that the Mine visit included a boat trip as well (albeit not as long), that it sounded more interesting than just sitting in a boat being lectured to in Polish and that it would be good to compare the underground experience there with that at Banska. We arrived at the visitor centre at opening time to discover what was possible that morning. A large party of Polish school children was milling around ready for its tour but we were not allocated to them! Instead there was to be a Polish tour at 10.00 and we could join that. We were given a 6 page resumee of the tour in English and told to go away and sit until later. I offered to pay but this was declined – the reason, it turned out, was that they couldn’t be sure how much it would cost until they knew the numbers coming for the tour! So it is 35 ZLN pp if there are 19 or more PAX, 37 ZLN for 13-18, down to 43 ZLN for 4-6. Fewer than 4 don’t seem to get a trip! A foreign language tour costs 37, 39 and 50 ZLN respectively pp. We filled our time by having a look at the Industrial Skansen at the back of the Centre – this had a number of old locomotives/steam engines and apparently ran a little “toy train” at busy times, but none of this had anything to do with the mine we were about to descend into. It also turned out that the visitor centre which looked like a mine shaft complex from around the 1950s/60s with its hyperboloid roof and winding gear tower was in fact completely “mock”, having been built from scratch as a Visitor Centre in 1956. The mine had actually ceased operation in 1913 and all the original above ground aspects had disappeared. Indeed it wasn’t that deep and the miners would have descended by ladders. We were then told by an English speaking guide who, unfortunately, was taking the kids’ group, that we could now pay the 35 ZLN! At that point a small “bundle of energy” in the form of a lady who I assume to have been the director came up to speak to the guide and we were introduced to her as “2 English visitors” – she beamed with delight on being told that we were only there because of the inscription - “The Certificate is expected to arrive any day now – possibly tomorrow” she enthused. She also mentioned that it was taking a long time to agree with UNESCO the exact design of the signs which were to be put on view to commemorate the inscription which is why nothing yet was on show. I thought of all those “unofficial” hand painted signs we had seen at WHS around the World in e.g Bangladesh and Ethiopia which UNESCO seemed to know or care nothing about! TG is managed by the “Tarnowskie Gory Land Lovers Association” (TGLLA) - indeed they get a special section in the Nomination File and received a special mention in the Polish “thank you” speech at the WHC in July for having looked after the place for 60 years. Our conversation broached the subject of other UNESCO mines such as Banska Stivianca. I gathered that money was a bit short for the TGLLA - We made ourselves really popular by pointing out that the video at Banska had differing language voice and subtitles so it could cover 2 languages in 1 showing whereas the TG Video was only in either Polish or English (and we obviously were to get the former!). It turned out to have been produced for the Nomination and they didn’t have the money to produce subtitled versions. And yes it was unfortunate that they were not able to offer reductions for seniors like other musea in Poland….. However it does seem that TG’s existence as a visitor attraction, and now as a “WHS”, owes a lot to dedicated enthusiasts like her and others in the TGLLA! And what of the visit itself? It takes around 90 minutes including the video and an exhibition across 3 rooms in the visitor centre which finishes with another video of happy smiling inhabitants of TG enjoying their idyllic country surroundings and playing at being mediaeval miners in the local “Gwarki Tarnogórskie” festival (“Gwarkami” was the name for the Galena ore. The mine guides wear the same “traditional” brown jackets as on show at the festival). You then pick up a helmet and descend just 40m in a modern Thyssen Krupp elevator. 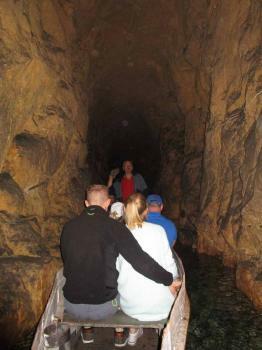 There follows a 1.74kms underground trail of which 270m is by boat. The Polish “hen party” we had been teamed up was kept happy by the guide and they gave a fine rendition of a Polish folk song during the boat trip! We obviously “missed out” on the detailed explanations (as well as the jokes! ), but got the general idea. We had taken in the hand-out in English before hand but largely you are just seeing 3 mined “chambers”, a series of tunnels between them and a couple of underground drainage streams - 1 of which you travel along on a rather tame boat ride. The whole experience is more “sanitised” than that at Banska Stiavnica. The TG paths are concreted rather than along rail tracks and on rough rock, and the water is well under control - whereas Banska fully requires those raincoats! On both, the helmets are needed - certainly for those of us who are 1.83m tall! Banska is entered via a drift and has no boat trip but the on-show remains of its mining activities seemed more realistic. TG just has a few strategically placed human models, pick axes and mine carts - parts of the Banska underground display could easily have ceased mining as recently as yesterday. It also shows a range of mining periods from the 18th - 20th C whereas TG claims to cover a much wider period - although, in fact, the “visit” seems to relate largely to the 18th/19th C, which covers the arrival of steam power from UK (first in 1787) enabling the existing mining activity to control the water far more widely and efficiently (“50km of main drainage tunnels and 150km of secondary drainage system, developed in the 15-16th centuries and further extended in the 18th-19th centuries”). It is worth mentioning that, although TG was originally about “silver” mining, the extraction of Lead and Zinc later became far more significant and it is badged as “non ferrous mining”. a. Is it an interesting/worthwhile trip? b. Does it capture/explain the site’s OUV? With regards to the first - well, as a trip out, especially if you had never been down a mine, it is an interesting enough experience. Perhaps, using what is claimed to be the “world’s oldest continuously operating narrow gauge railway” to get out there in summer it could be a pleasant, even memorable, family day out. But we found the visit at Banska more interesting/worthwhile and it has the fine town as well. As regards the second – well that takes us to the whole issue of the site’s OUV. The ICOMOS evaluation reads as if it was written by someone on a “bad mood” day. Everything is wrong or is damned with faint praise. E.g - “The State Party provided some hand-drawn tri-dimensional sketches that allowed for some (sic) visualisation of the underground system.” (and, later, “ICOMOS considers that a systematic campaign of 3D documentation of the underground system is needed for scientific but also conservation purposes.”) . Comparative Analysis, Integrity and Authenticity - all lacking. Monitoring - needs improvement. Proposed OUV criteria i, ii, iii and iv - all unjustified. How did it get inscribed?? Well, ICOMOS left a little loophole about the vague possibility of demonstrating the value of the mine’s water management with more investigation and also made some “errors” which Poland and the WHC were able to pounce upon. Thus, ALL WHC members (led by Turkey) unanimously voted in favour of immediate inscription with the only argument being on which Criteria - i, ii and iv were chosen, with Poland even swinging “a masterpiece of human creative genius” for all those kms of tunnel and the use of the water for the town’s public water system! (A viewing of the WHC discussions on 9 July 2017 starting at 3hrs 19 mins provides an interesting example of how ICOMOS can be ignored and some sites get inscribed!). So - as a “WHS traveller”, you are left with a somewhat problematical and esoteric OUV to try to appreciate. There is nothing much above ground to see and indeed, most of what is claimed to be “special” about the site, is underground and not included in the tours or, as ICOMOS picked up in the case of many of the workings, not even documented (though there is a 1926 water tower which we didn’t see which was discussed at the WHC!). Really you have no choice but to do at least 1 of the underground trips, do a bit of extra reading/investigation, tick off the site as “seen” and move on. I visited the Historic Silver Mine and the Black Trout Adit in August 2017. There is a private train line between Katovice and Tarnowskie Gory, which is much cheaper than the Polish National Rail. At 9:30 I took a bus from the bus station by the TG train station, which dropped me off right in front of the Historic Silver Mine Visitor Center / museum. It opened at 10:00 and my tour started at about 10:30. I was told that the English tour is only at 12:00 and was given a few pages of the site description in English. But soon after the tour started, I gave up on reading it up because it was difficult to read it in the darkness of the mine. After the tour ended at about 12:00, I decided on how to get to the Black Trout Adit by looking at the bus routes and time tables at the bus stop in front of the Visitor Center and by Google Mapping the names of various bus stop names along the routes to find the nearest bus stop to the Adit. I took a bus, which came at about 12:30, from the Visitor center at 50°25'30.4"N 18°51'01.3"E to this bus stop 50°25'07.1"N 18°49'40.5"E and walked the rest of the way to the Black Trout Adit at 50°25'38.2"N 18°48'26.1"E.
The 600 m boat ride in the underground canal at the Adit, which is to show us the Underground Water Management System, was the longest underground boat ride I have taken, in which sense it was somewhat interesting. On the way back I took a bus from 50°25'14.6"N 18°49'04.5"E directly to the train station where I arrived by 15:30. I visited the largest salt mine in Poland at Klodawa several days later, and this one where I went down to the depth of 600 m, was, although not a WHS or TWHS, not only more interesting than TG, but also was one of the most intriguing mines I've ever visited. The photos from this mine can also been seen at the link below. After a stop over in Wroclaw at a friend's I was stuck with the question, what to visit on my trip towards Cracow. Seeing Tarnowskie was on the way and scheduled for the WHC 2017 I figured, I may as well go and see it. Frankly, what I got to see didn't really impress me at the time. I didn't even bother to write up a review, feeling this would be in vain. Yeah, yet another mine! The only unique feature I found was the boat ride they have on a canal deep in the mine which makes for a pleasant excursion. The picture is rather dark, but that's what it looks like. Still, pleasant does not indicate OUV. Tarnowskie can be reached by train from Wroclaw and Krakow. It is also connected via bus to Katowice. Bear in mind, though, that the mining museum is still quite a long walk away from the town center and train station. On the other hand, the town center has some historic buildings worthwhile visiting, emphasis being on some. Best transport information (as for all of Poland) are found at e-podroznik.pl. At the museum there are regular tours that you can join, mostly in Polish, though. Check the schedule on their website. You are in the Silesia and Cracow hotspots. For nearby Katowice two prospective sites are mentioned in our forum: the Cathedral of Christ the King and Nikiszowiec, a coal miner city. Katowice itself isn't all that nice. Some basic information and hints how to visit the site - possible inscription of 2017. Whatever the final inscription will be the most impressing sites are the Historic Silver Mine (Zabytkowa Kopalnia Srebra) and Black Trout Adit (Sztolnia Czarnego Pstrąga) both located south of Tarnowskie Góry town in Silesia Voivodship (Southern Poland). Due to working hours it is better to start visit form Historic Silver Mine (there are guided tours in English, German, Russian or Czech - at least in theory) ask at the main office. The whole trip takes around 1,5 - 2 hours. After visiting the mine you can also visit the nearby open-air museum of old mining machinery. The trip to Black Trout Adi requires some kind of transportation as it is located around 5 km from the Mine (there is a good marked bicycle trail). There is an underground water tunnel with boat service (separate ticket is required, unfortunately there are no combined tickets). You can start your boat trip from any of two mining shafts (szyb Sylwester or szyb Ewa) - if the boats are not there you can walk in the park to the other side or wait until the boats arrive. 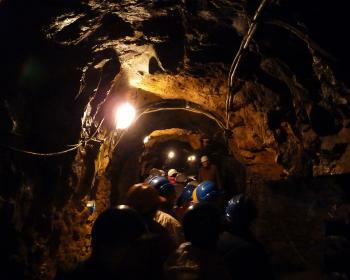 The whole trip takes around 40 minutes including walking down and out the mine. Depending on what finally will be inscribed there are many other places in Tarnowskie Góry connected with mining - the whole Old Town (with many old houses - some of them belonging to old miners), old church, mining monuments, belfry. Other mining monuments are preserved in close vicinity of Historic Silver Mine - old mining shafts, huge slag heap (Hałda Popłuczkowa), former narrow-gauge railway. For visiting all those sites propably one day will not be sufficient. 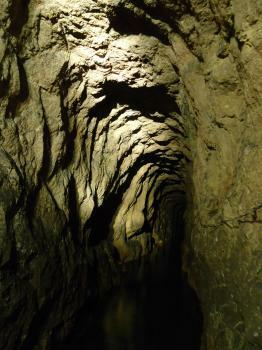 If you want to see the most important sites opt for the mine itself and the Black Trout Adit - those two are must-see.